Last night, our 10 man formed up again and went back into Icecrown Citadel. 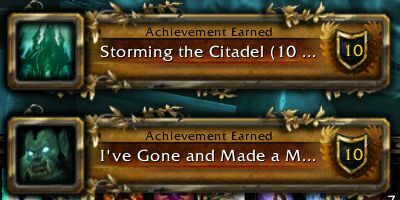 After having our asses handed to us - due to some unknown bug (we suspect Marrowgar was doing 25 man damage in our 10 man raid - there are some reports of this bug on the Warcraft forums) - we came back in this week and destroyed the first four bosses. We quickly one-shot Marrowgar and then two-shot the remaining three bosses. Not a bad outing for our team which had not seen any of the last three fights prior to last night. And to top it all off, a "hard-mode" achievement to boot.